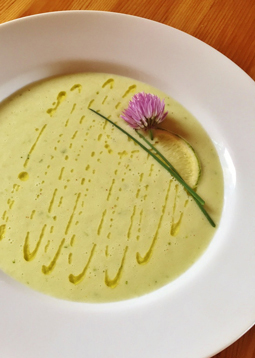 Chilled Melon Soup - A recipe from Savor California, the online showcase for extraordinary gourmet foods and beverages from California. Seed, peel and chop the melon into 1” pieces, then add, with any juices, to the work bowl of a heavy duty blender or food processor. Add yoghurt, oil, lime zest and juice, mint, salt and cayenne, and blend until smooth and evenly green. Season to taste with additional lime juice and salt, if necessary. Strain the soup through a fine mesh strainer if a smoother texture is desired, then chill for two hours. Serve cold, in bowls or cups, drizzled with Stella Cadente Persian Lime Olive Oil and garnished with fresh chives or chive blossoms.